What if it were free? 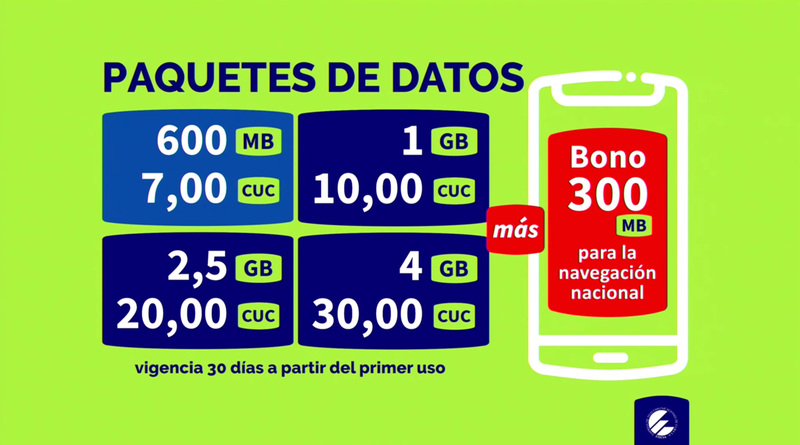 After several months of trials, ETECSA announced the availablity of third-generation mobile access to their national intranet and the global Internet in a televised "round table." The prices are quite steep for a typical Cuban and I suspect there would be relatively few subscribers among the 34% of the population that is not yet covered. Furthermore, many users will have to buy new phones to use the service. 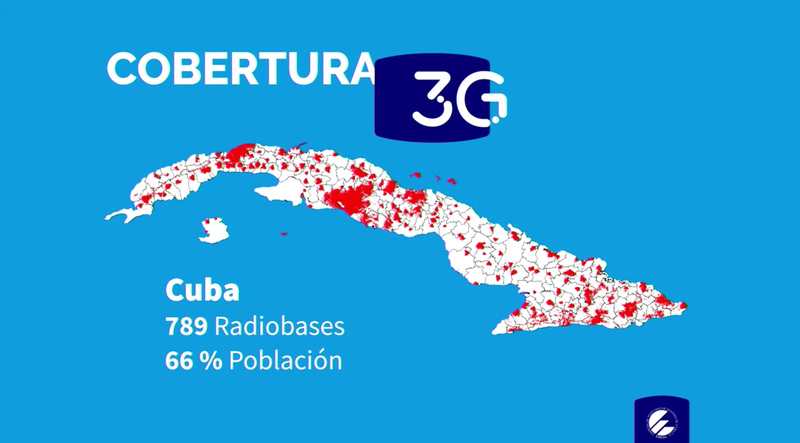 (There are still 1,084 second-generation mobile base stations in Cuba). Network performance during the trials mentioned above was poor — connections were unreliable and slow. Part of that may have been due to the fact that access was free, but it remains to be seen how fast and reliable the mobile access will be. That will be determined by demand and infrastructure — the capacity of the base stations and backhaul. Access to the national intranet costs less than access to the global Internet. While local access saves some congestion on Cuba's international links, it also encourages a Cuban "walled-garden." Cuba is developing local content and services, but they cannot compete with what is available globally. Cuba should open to the world and also aim to be a provider of Spanish-language content and services. There is also a political dimension. Cuba's president, Miguel Díaz-Canel hinted at a walled-garden strategy when he addressed the Parliament saying "We need to be able to put the content of the revolution online," adding that Cubans could thus "counter the avalanche of pseudo-cultural, banal and vulgar content." I can't argue about banal and vulgar content (and worse), but the cure of a walled-garden in a nation with a government-monopoly Internet service provider is worse than the disease. (Access to the national intranet portal has been blocked in the US — I'd be curious to hear from others who can access it). 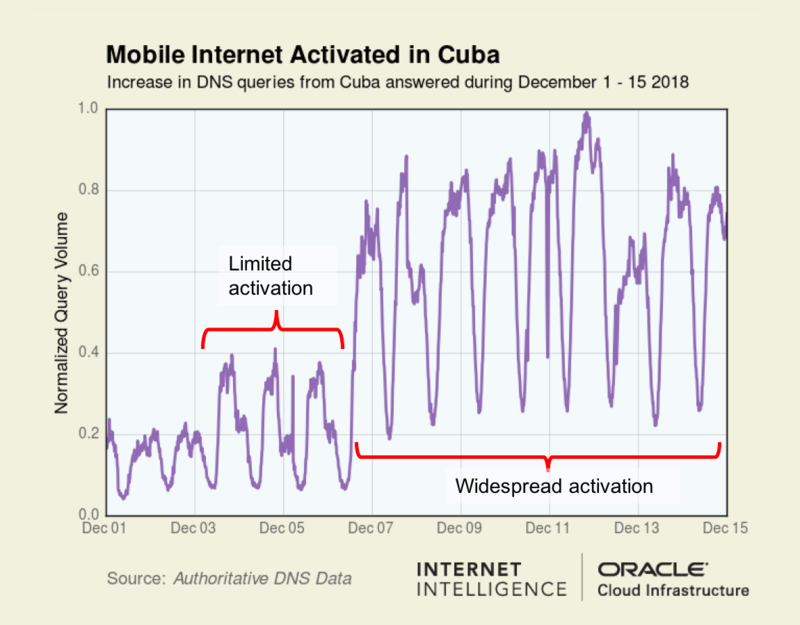 If performance is good enough, mobile access will be more convenient and comfortable than the current WiFi hotspots or navigation rooms so it will become the way most Cubans go online. That would be an improvement, but far from ideal. As I have said many times, 3G mobile, WiFi hotspots, home DSL, public navigation rooms, street nets, and El Paquete Semanal are stopgap measures and Cuba should be planning to leapfrog current technology in the future. We should not forget that 3G mobile technology is around 15-years old. Another interim step could be to augment Cuba's current O3b satellite and terrestrial connectivity to significantly increase backhaul capacity and offer free 3G mobile access. Doing so would lead to a population of trained, demanding users and enable many innovative, practical applications. That may sound crazy at first, but we take free sidewalks, roads, firefighting, etc. for granted and a few cities offer free public transport — why not ubiquitous, free 3G connectivity? 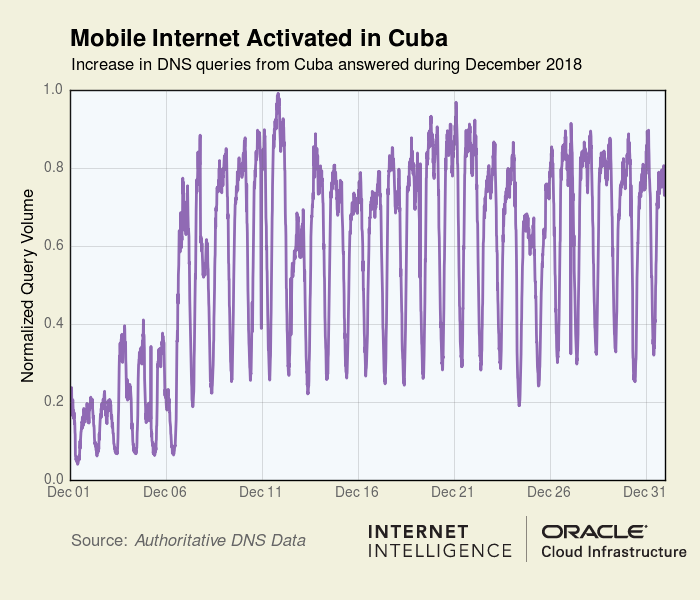 Oracle reported a significant increase in Cuban DNS queries immediately following the 3G rollout and, in spite of high prices, the increase persisted through mid-December. 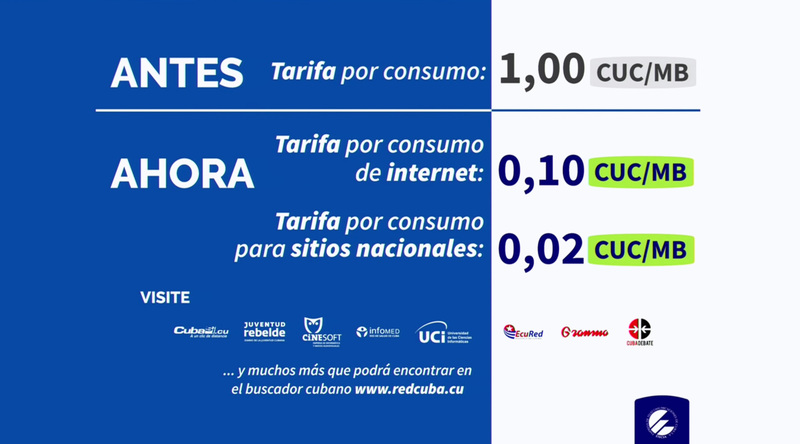 It would be interesting to know what portion of Cuban's new 3G access is paid for by ex-pat families and friends as opposed to Cuban nationals. The DNS query rate reported by Oracle continued through the end of the year. It dropped off on December 13th and again on Christmas day, but remained much higher than during the limited activation period which was double the pre-rollout rate. (What happened on Thursday, December 13th)? Oracle reports DNS queries and other statistics here and you can view a plot for the previous week for a nation. (Click here for Cuba last week). There was a dip last Thursday as well — coincidence? Local Time: Tuesday, April 23, 2019 07:05 AM PDT – Page Load: 0.3398 Sec.